Now the lawn has been sown and I’m waiting for my cottage-garden seeds to germinate, it was time to turn my attention to elsewhere in the garden. The borders are a bit of a no-go area at the moment – I don’t want to be pulling out any emerging flower seedlings by accident, so I’m staying well away until it’s apparent what pops up. Last year a friend and I created a little patio area at the end of the garden, where the last of the sun’s rays shone each evening. It was to be the ideal spot to relax of an evening, but at the moment it looks a bit out on a limb. I wanted to create some height around the area, without closing it off completely – so I pitched for some garden arches along the bottom edges. There should prove ideal for some ross to scramble over, providing a semi-screen, with the added bonus of some gorgeous flowers and scents. Off I trotted into town, where the shops are increasing their garden ranges by the day it seems, and purchased two cheap metal arches. Assembling them quickly, they were soon in place at the end of the patio. Now for plants. I’d bought some bar rooted roses a week or so back, and I was itching to get these into the ground. I’d plumped for old-fashioned varieties to match the emerging theme, and the roses of choice were ‘Albertine’ a rambling variety, and two climbers: ‘Clementine’ and ‘Paul’s Scarlet’. Bare rooted plants are much less expensive than plants for sale in pots, but they do need a little extra tender loving care. First you need to carefully remove any packaging they arrive in, and then give the roots a really good soak in a bucket of water. The hole you dig should be big enough to spread the roots around in, and the soil should be replaced firmly, to help the plants get a hold and stop them rocking around. That all done, give them a jolly good water in, re-firm the soil, and they should soon romp away. 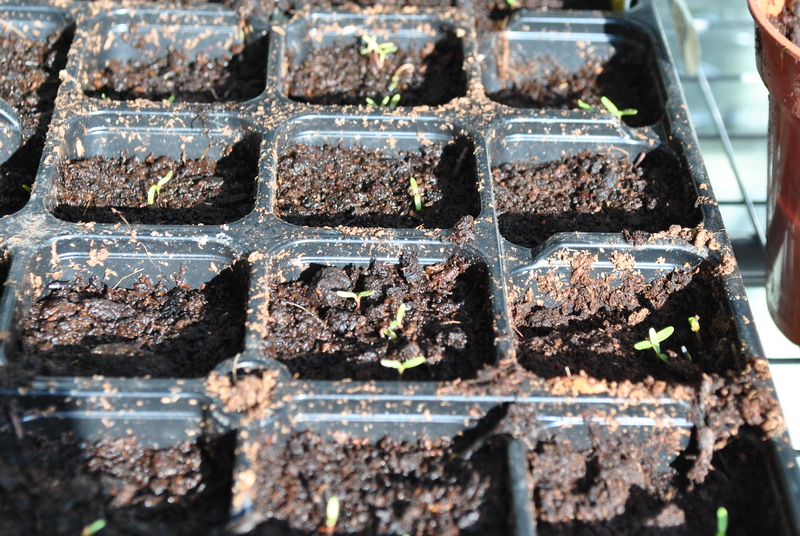 I’m happy to report that my plants have begun to show signs of life after only a week in the ground. With any further gardening in the borders on hold for the moment, I thought I’d give the shed a quick slash of colour. The fence outside the back door is painted a lovely sage green, so off I popped to the hardware store to get the same for the shed. A most enjoyable afternoon was spent painting, and although it will need another coat (why is there always another job? ), I’m happy with the result. Little by little my patch of garden is beginning to take shape, and I have to say, it’s all rather exciting. After what seems like an age peering out of the window at the garden, waiting for winter to end, it would appear that spring is most definitely around the corner. The days are becoming longer, and elusive sun appears to be making a slightly more regular appearance. My new garden has no real shape, and I have spent the winter trying to work out what on earth to do with it. 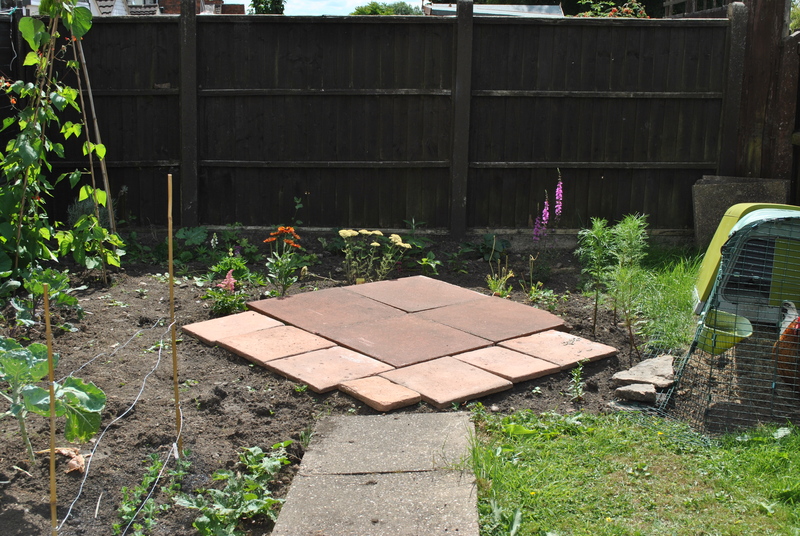 I’ve come up with the loose plan of a seating area at the bottom to catch the last of the summer rays, and elsewhere in the garden, great big blousy borders: chock a block with flowers and shrubs to attract insects and birds. That’s the plan. In my head. The reality at the present moment is very different to this romantic notion. The present layout of the garden is a patch of lawn, an odd assortment of plants I put in last year, and the bane of my gardening life at the moment: the dreaded RIGHT HAND SIDE. Let me elaborate. The left hand of the garden gets the lion’s share of the sun, being west facing. 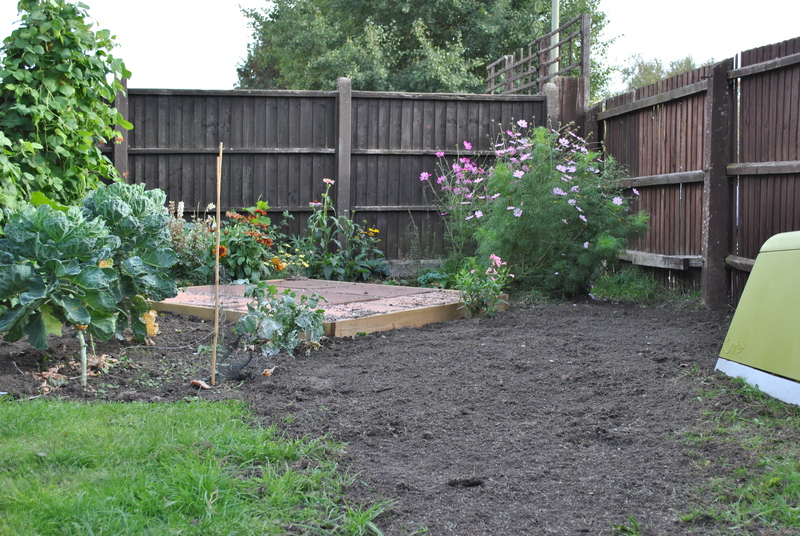 There’s a passable border, and a half decent patch of lawn – in short, stuff to work on. 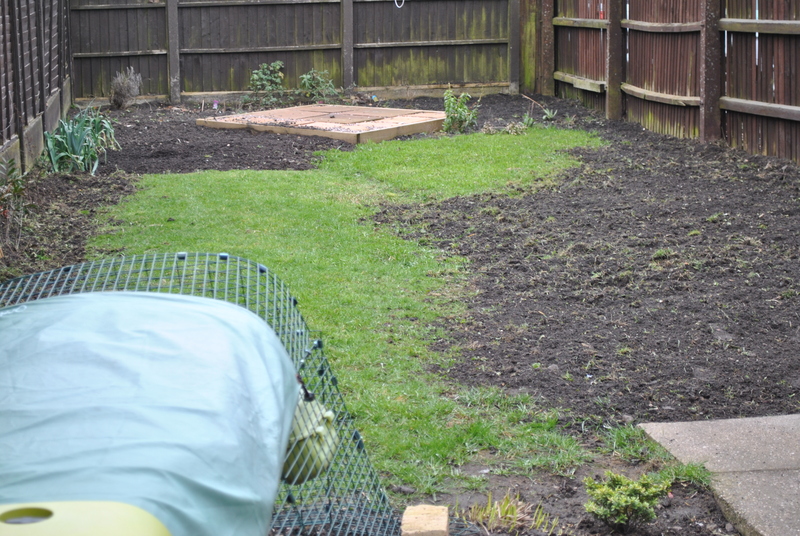 In contrast, the right hand is made up of patchy lawn interspersed with weeds, and great big bare patches where the chickens have been in situ – and quite frankly have trashed the joint. Together with dips and hollows and being completely uneven, I’ve spent a good many moments despairing what on earth I was going to do with it. Then with the arrival of the sunshine at the weekend, it came to me. Like a flash of inspiration. No amount of filing, raking and trying to level the ground would ever make it look half decent. So I decided to flatten it and start again. Out came the rotavator, and like a woman on a mission I turned over the patchy grass and bare patches. A quick rake over, and I can already see the potential my hard work has unlocked. I still need to get all the twitchy bits out, and work on levelling out the patch, but now it’s much clearer how the garden might take shape. A visit to the garden centre later, and I now have a selection of shrubs and climbers to begin designing my garden. I’m starting at the fences and working my way in. The layout will evolve naturally, with shrubs, perennials and lots of cottage garden seeds: and the bits that don’t end up as borders, I’ll turn into lawn. Rather than being a daunting task, the garden has suddenly turned into a place of endless possibilities. And I have to say I’m way more positive about it now. To begin from a completely blank canvas, and stamp my mark on it completely, is really quite exciting. I’m intending to do this as thriftily as possible, and do hope to share the journey with you. With the summer drawing to a close and autumn well and truly getting a hold, the garden is showing the signs of the season switch. After a summer of delivering the goods, some plants are looking a bit worse for wear and most definitely past their best. So this weekend was devoted to a bit of a tidy up. First job was to whip off any dead flower heads and dump them in the brown bin. Next up was the patio: the pots have given all they have to give, and the pallet planters I made earlier in the year were now looking decidedly tatty. The strawberry plants looked dejected and unloved, and the herbs would probably thank me for a tad more root room. In next to no time I’d whipped out all the plants. The herbs were replanted straight into the border and any strawberry plants that looked like they had potential to perk up, got potted up and put in a sheltered spot near the shed. If they recover for next year, that can only be a bonus. With an empty planter, and spaces to fill, off I went in search of some new plants. Now, people of Hinckley, I bring you great news. There are currently great bargains to be had in that there town. In their eagerness in getting the Christmas stuff on the shelves (don’t get me started on that one – we’ve not even had Halloween yet) the shops are clearing out the gardening stuff – and practically giving it away. In one shop I was delighted to find that seeds were down by 75%. Yes, 75%! After a good rummage through, my basket was quickly filled with an assortment of flower seeds: some cottage garden annuals, some that attract butterflies and others that are night-scented. The garden should be an absolute riot of colour and insect activity next year. In another shop, I spotted some trays of pansies and violas on a trolley. They looked a bit droopy, but nothing a good old drink couldn’t sort out. But my attention was grabbed by the price tag… 20p a tray. Yes, you did hear that correctly. A penny a plant. It would be madness not to take them up on the kind offer! Chuffed to bits with my garden on a budget, I trotted off back home to finish the project. 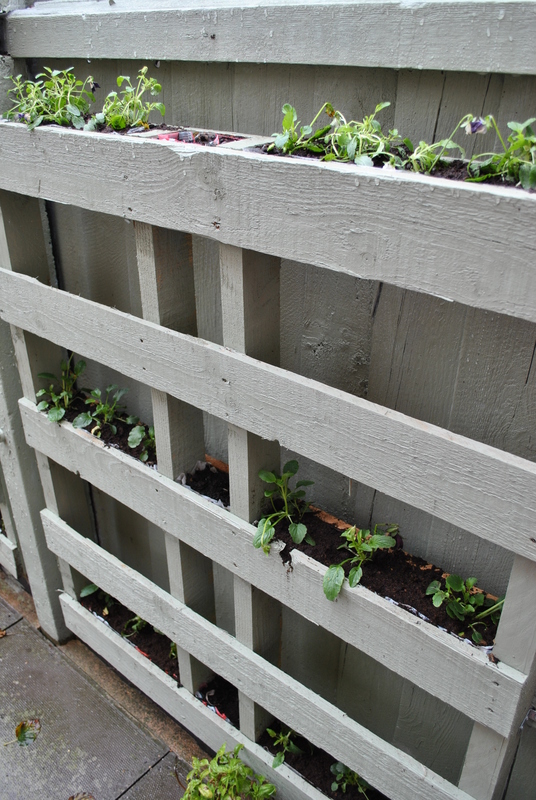 Into all the planting pockets went new compost, and into that went the violas and pansies. A good watering has seen them come back to life, and there were even enough plants left to fill some big tubs. Once they get established and start filling out, they should look amazing. So, for the grand total of 60p, I should have a cheerful display of flowers all through the winter – right outside my back door. When I moved from Chook Towers to Chook Cottage, the garden was nothing but a scrap of lawn with an old path down the middle. The first job was to dig up a bit, get some veggies in, and install a seating area at the bottom. Standing back, I was pleased to see it was coming along like I’d planned it (I hadn’t much) – but the path was bugging me. It was old, it was tatty, and it chopped the garden up into two distinct halves. So I stuck it on a Facebook free site and some kind people nipped round, dug it up and took it away with them. Then came the next challenge. One side of the lawn is pretty much there – quite level, and grassy. The other side – where the chickens live – is uneven and weedy. Not sure quite how I’d marry the two up, I’ve decided to dig over the weedy bit, level it all up to the grassy bit, and sow seed. I should then end up with a nice lawn which I can then chop about into a country cottage type shape, and whack some plants in. So, wellies on, I set to work. The chooks were moved up the garden a bit to give a bit of space, and in no time at all I had a weed/grass free patch, which I raked, trod over, raked again and sprinkled grass seed on the top. A gentle rake over to incorporate the seed into the soil, and hopefully my new bit of lawn will start sprouting any time soon. Gardening over, I glanced at my watch and discovered I’d actually been on the job for a while, and I’d only just left myself enough time for a quick shower and spruce up before I was getting picked up. Yes. Picked up. By a man. With a pulse, and a cheeky smile to boot. It seems I must have managed the transformation from grubby oik to glamour puss quite well. When I opened the door to him, I definitely got a low whistle and a “Wow!”. One of the top priorities when moving house was making sure we had a couple of chickens. I’ve kept chickens for a good few years now, and they make excellent pets. 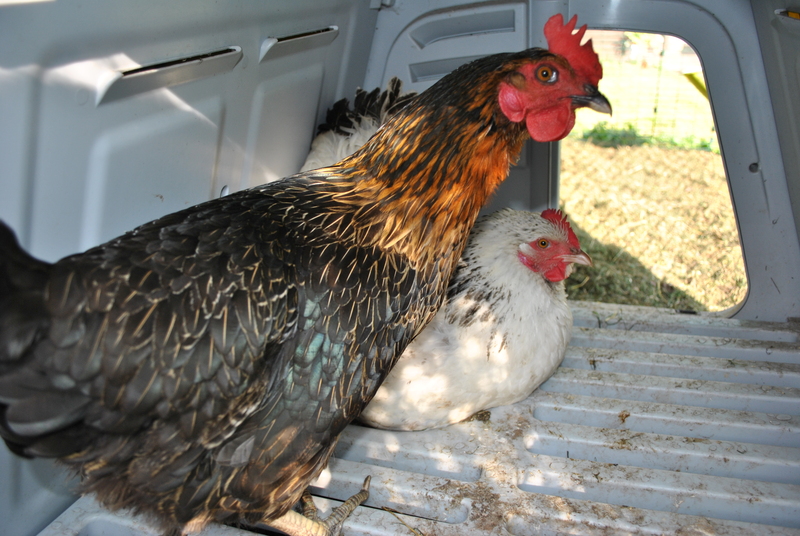 They have simple needs: water, food and somewhere dry to roost – and you get fresh eggs to boot. So at the bottom of the garden live Liza and Judy: one black, and one white chicken. They’re happily ensconced in their Eglu (posh chicken house to you), and although a bit skitty to the human touch, they’ve been delivering the goods on a daily basis. Until this week. Wandering down to collect said eggs, I discovered that Judy was spending longer than was really necessary in the nest box. Hour upon hour went by, and still she sat.. It would appear that Judy had indeed gone broody. A broody chicken thinks that the eggs she’s sitting on are going to hatch, so will sit on them continuously, only coming out for a sporadic bite to eat. Obviously, with no cockerel, our eggs are not fertilised, so will never, in a million years, turn in to fluffy little chicks. Apparently this can go on for three weeks, and apart from Judy maybe not getting enough nutrition while she’s lounging around in there, it means that Liza has to practically climb on top of her to lay her egg. Not ideal, so I decided to try to break the pattern. The internet says to gently lift the chicken off the nest box and close the door so she can’t get back in. Opening the back door to do the deed, I got a distinctly frosty reception as I leaned in to lift her off. She puffed herself up, fixed me with a steely glare, and growled to warn me off. I had no desire to get my hands pecked raw, so executing Plan B, I donned my thick gloves, and shooed her off the nest. This went on for a good few days, and the system was working marvellously. Up until the other night. Dusk had fallen and I suddenly remembered I hadn’t let the girls back in to the coop to roost. Out in the garden I discovered them crouched by the door, obviously settled down for the night. I couldn’t leave them to the elements in case the weather turned or a predator decided to make a play, so they had to be moved. Slight problem. The run is only 3’ high, and the only way I could get to the girls was through the main entrance at the bottom. So, there I am, crawling commando-style on my belly, up the run. In my pjamas. Through chicken poo and yesterday’s grass cuttings. Glamorous, not. Eventually I managed to get them to bed, and backed out from whence I came, looking slightly more bedraggled and smelling a tad nastier than I had half an hour ago. But the girls were safe. Judy’s not broken the broodiness yet, but I turf her off the nest each morning in the hope that her motherly instinct will disappear any time soon. The latest update from the garden comes from me peering out at a dank and dismal day, but on the up side, the weather for the carnival was splendid, and the patch is getting a good old drenching. 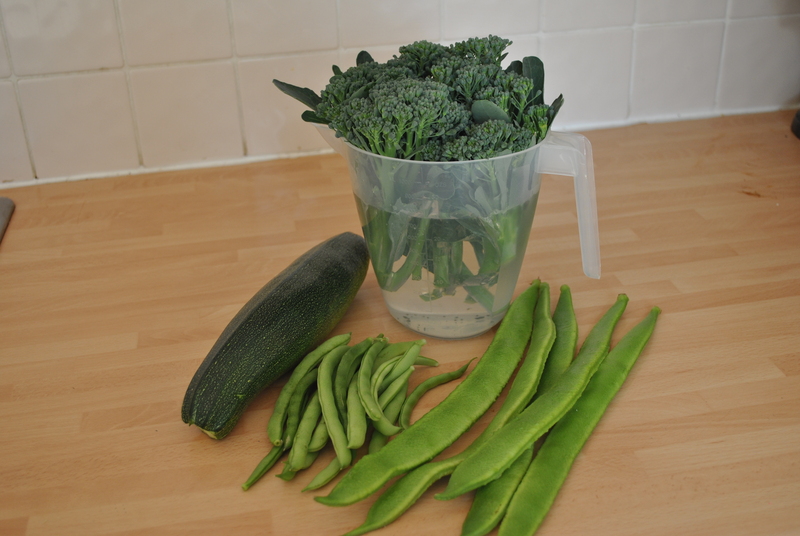 This week I’m delighted to announce that we’ve had our first real harvest from the vegetable plot. After the broccoli heads bolted and turned to flowers earlier in the season, I chopped off the non-edible stems, but left the plants in situ. It appears this was the right thing to do, as they are now throwing up small heads on a regular basis, and we’re picking these as cut and come again vegetables. With any luck we’ll be harvesting for a good time to come. I’ve also done a bit of digging around in the history of the house, and it seems a farmhouse stood on the plot in the mid 1800s. This could explain the rich crumbly soil, (an absolute joy after 20-odd years of gardening on clay) and why after a somewhat slow start, once established, the plants appear to go a bit bonkers. The runner beans – looking decidedly dodgy just a few weeks back have now flourished and sprinted up the canes. In no time at all, they bushed out, flowered profusely and are now giving us a steady supply of lovely succulent beans. I’m also thrilled to report that the other slow starter – the courgette plant – has now picked up and is pushing out fruits left, right and centre. My peas are also looking lush and healthy, and it won’t be long now until we’re picking stuff that’s ‘as sweet as the moment when the pod went pop’. Whilst this is all excellent news, the star performers in the garden have to be the pumpkin plant and the French beans. The pumpkin has snaked its way towards the bottom of the garden, and is now fanning itself up the fence panel; with two decent-sized fruits forming already. The French beans have foliage now so thick, and so dense that I have to do a fair bit of rootling around in there to uncover the beans. But what a treat when I do. They are so sweet, that many just get chomped raw in the garden, and don’t even make it to the dinner table! And if the amount of flowers on the plants is any indication of the potential harvest, we’ll surely be bi-lingual by the end of the season. So, this weekend, after removing a couple of stray caterpillars, we enjoyed laughter-filled feast of beans, courgettes and broccoli to slap by the side of the Sunday roast*. Although I’m biased, the flavours were out of this world. Now that the greenhouse has gone to pastures new, the space I’d earmarked for it stood barren, neglected and bare. A rootle around the garden soon produced an odd assortment of reddish-coloured slabs, so I thought, “Aha! I’ll build myself a patio”. It made perfect sense. The area gets the last bit of sun in the garden, and already I was imagining myself sitting upon it, floaty dress and floppy hat at the ready; trashy novel in one hand, chilled white wine in the other. With that image in mind, I weeded the area, then levelled it off the best I could and chucked the slabs down in a rough diamond shape. “Sorted”. I thought, as I stood back to admire my handiwork. All it needs now is something to sit on, and Bob’s your uncle. I proudly shared my newly acquired slab laying skills to all my friends on Facebook, and one of them replied back, “Err… it’s a bit wonky”. Standing firm, the reply came back “I’ll help you level it”. He continued, “I’ll have a think, and bring some stuff round at the weekend”. The weekend came, and the stuff duly arrived, namely four thick planks of wood, weed suppressing membrane, an assortment of tools and numerous bags of pea shingle. He’d obviously had a think, and meant business. 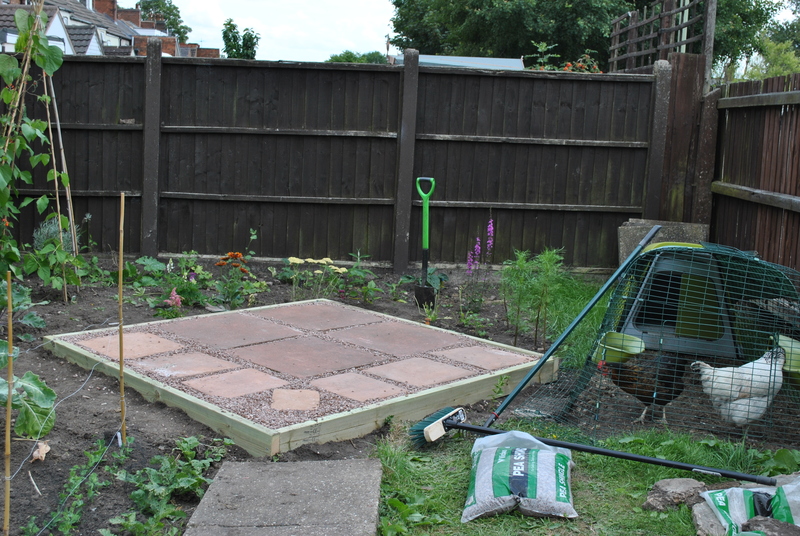 The first task was to fetch up my wonky assortment of slabs, then level the area properly. We then sawed the planks into six foot lengths and I happily screwed them together with my woman-drill to form a square frame. 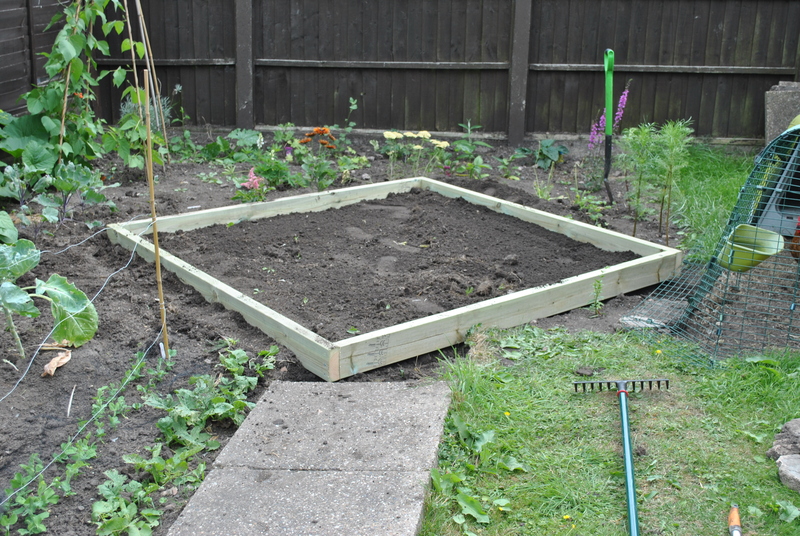 After digging the same shape in the garden, the frame plopped in, and we performed a bit of last minute levelling off. Next we lined the frame with the membrane and put a good layer of pea shingle inside. 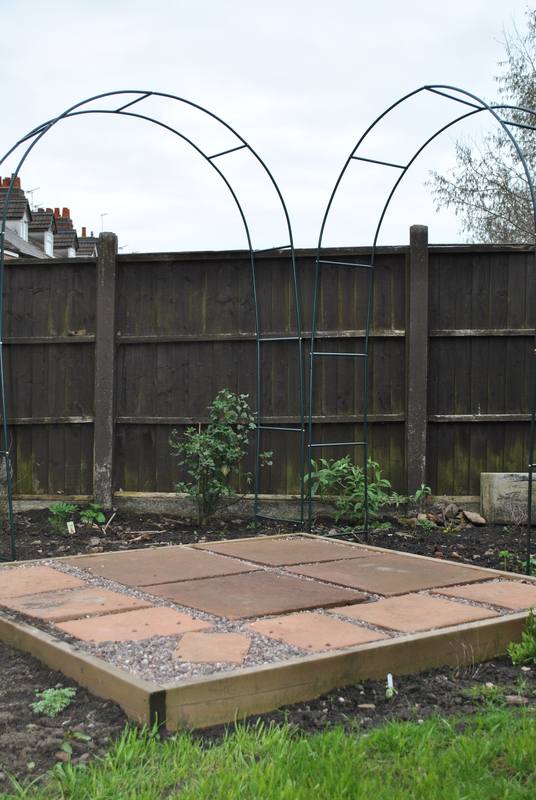 The slabs were then put on top, and spaced out so it looked like we’d actually planned it out like a dream. Another layer of pea shingle went over the top and I merrily set to work sweeping this into the gaps. A good watering over the top cleaned it off nicely, and brought out the colours of the shingle beautifully. Standing back to admire our afternoon’s work , I had to say that it did look remarkably good. And I grudgingly had to admit to myself that, yes, it did look more inviting than my assortment of ‘slabs chucked on soil’ arrangement. I’ve since planted an assortment of cottage garden plants around the back, including delphiniums, lupins and poppies, which should add a bit of height and look great when they all fill out. So, for little cost, a bit of effort and a lot of sweat and toil in the blazing sun, I have myself a lovely little area to soak up the last rays and enjoy a glass of something yummy.